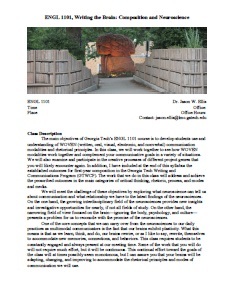 My English composition students at Georgia Tech are now well into their second major project, so I figured that I should get in gear and post my syllabus for my newly designed, WOVEN (written, oral, visual, electronic, and nonverbal) focused ENGL 1101 syllabus. The title of my class is “Writing the Brain: Composition and Neuroscience.” Unlike the previous iteration of this class at Kent State called “The Brain and Writing,” I overhauled the whole class to only use nonfictional readings and more strongly emphasize multimodality in assignments and discussion. So far, I am very pleased with the results as demonstrated by the great work and commitment of my students. If you would like to read my syllabus, you can download it as a PDF here: ellis-jason-fall2012-1101-syllabus.